UP Sachivalaya Admit card 2015 - Download SAD UP Peon, Anusevak, Farrash hall ticket Exam date , UP Sachivalaya Group D Admit card 2015Secretariat Administration Department, Uttar Pradesh (SADUP) also known as UP Sachivalaya, had invited applications for filling up 368 Group D posts of Anusevak/ Farrash / Peon (चपड़ासी). There is a huge no. of applications received for these posts i.e. approximately 23.25 lakh. The selection for these posts is to be done on the basis of interview. Now the latest news is that the recruitment Sub-Committee will not be conducting direct interview for there posts since the no. of applicants is so huge. So the department is going to decide whether to conduct a written exam these posts. The Admit card of UP Sachivalaya Group D / Peon exam will be released by the commission around 10-15 days before the exam. Those candidates who had applied, can download UP Sachivalaya Exam Admit card from the direct link given below after release. 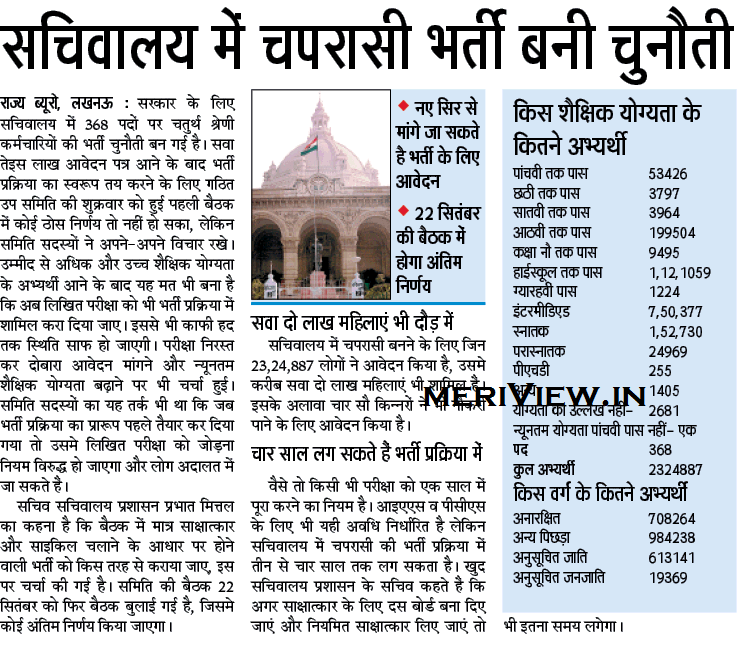 UP Sachivalaya Admit card 2015: Here you can check latest updates regarding this exam. Click on the image to enlarge. The eligibility for these posts is 5th pass but lakhs of graduates, Post graduates, engineers, PH.D., Inter pass had applied for these posts. 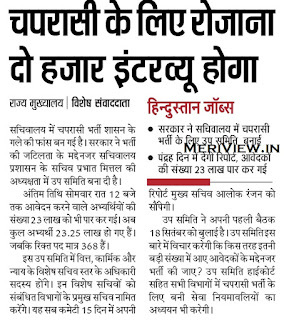 A total of 23.25 lakh applications were received by SAD UP for only 368 posts. Since the no. 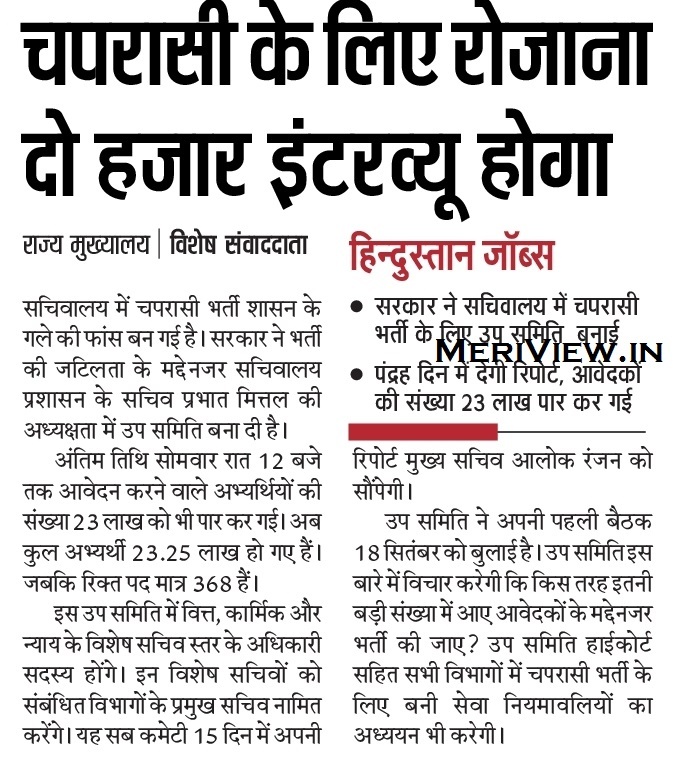 of applicants is so huge for this vacancy, so UP Govt. had constituted a committee to decide whether or not to conduct a written exam for these posts. The main problem with interviews for these much applicants is that it may take up to 3 years to complete the interview process if only interviews were to be held. So there are chances that a written exam can be conducted. If that happens, then applications will be invited again. SADUP may conduct written exam for Group D posts. For that, admit card will be released around 10-15 days before the exam date. Candidates have to download UP Sachivalaya admit card from the official website sadup.in if they got released. The test will be held at various centres in Uttar Pradesh. UP Sachivalaya Group D Admit card release date: to be notified UP Sachivalaya Group D Exam date 2015: to be declared shortly The candidates may download UP Sachivalaya admit card from official website after release. The admit card should be printed by the candidate on a A4 size paper and bring at the time of exam to the venue mentioned in them. Also candidates should check the details given on admit cards carefully. In order to download the admit card for UP Sachivalaya Group D exam, candidates need to visit the direct link provided here (after release). It will take you directly to download page. Then candidates need to enter their registration details and click submit. Their UP Sachivalaya Group D Admit card 2015 will be shown to them. Candidates have to take a print of it. After printing, they should follow all the instructions given on it and follow them accordingly. This admit card is to be bought at the time of examination mentioned in it. No candidate would be permitted to enter the exam hall with admit card. UP Sachivalaya Interview Call letter: If interview is decided to be conducted then candidates should bring the following documents and their photocopies at the time of interview. Physically Handicapped Certificate (If applicable). Certificate of Freedom Fighter Dependent. Certificate of Service period in last department. Color Passport size Photo (not older than 03 months) with signature.